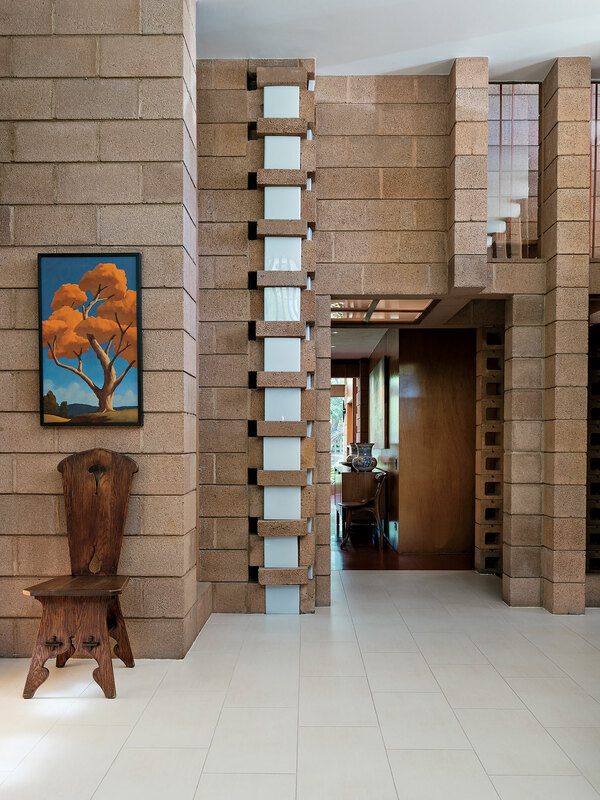 A Frank Lloyd Wright apprentice-designed home embraces the famed architect’s principles of organic design while manifesting its creator’s personal vision. In 1932, legendary architect Frank Lloyd Wright opened his Spring Green, Wisconsin, home to 23 aspiring architects who would live with him and study under this tutelage. 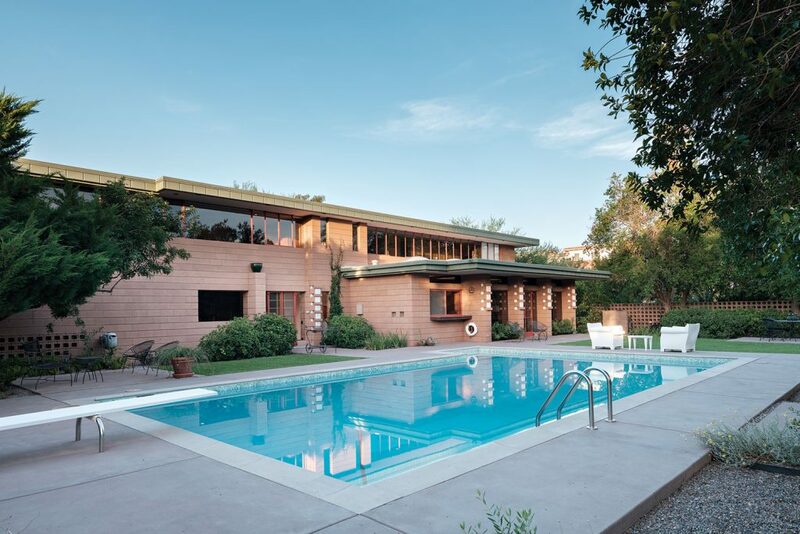 Three years later, Wright moved his students to a camp in Chandler called “Ocatillo,” and in 1937, the group—known as the Taliesin Fellowship—began construction on the architect’s Scottsdale retreat, Taliesin West. 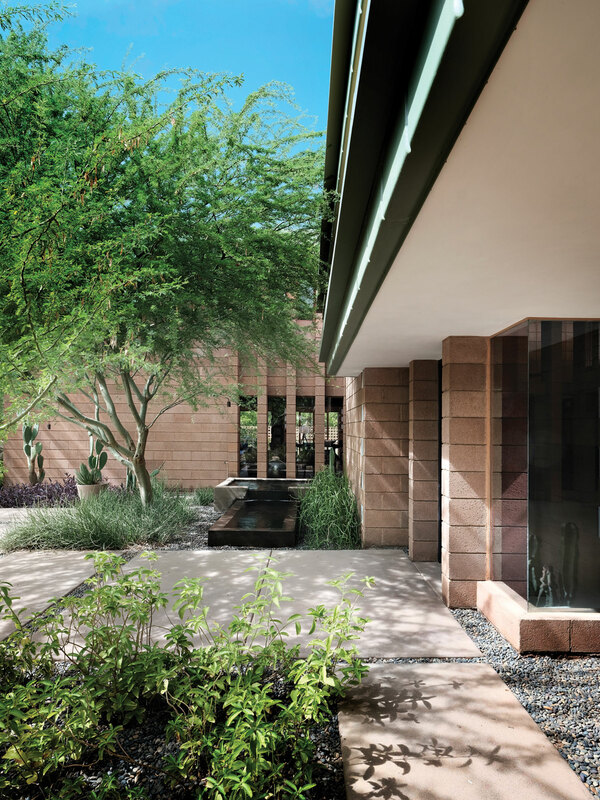 In the harsh Sonoran Desert climate, the Fellowship developed into a creative laboratory that attracted some of the industry’s greatest minds. During Wright’s lifetime, more than 600 apprentices passed through the compound in the foothills of the McDowell Mountain. One such eager protégé was Charles Montooth. As a student at the University of Chicago, Montooth fell in love with Wright’s work and, while teaching in Michigan, would spend his free time driving around the Midwest seeking out and examining houses designed by the master. Montooth’s widow, Minerva, recalls a meeting between Ruth Pew, owner of the now famous Pew House in Madison, Wisconsin, and her husband: “She said, ‘If you’re so interested in Frank Lloyd Wright, why don’t you go study with him?’’ Following a stint in the Merchant Marines during World War II, that’s exactly what he did. 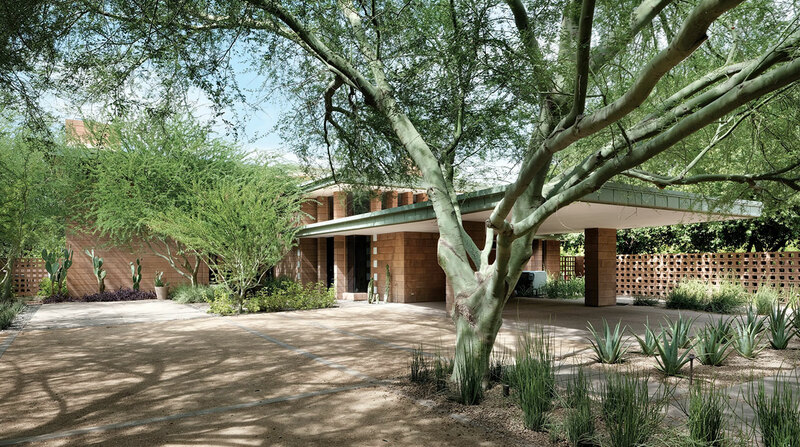 Montooth worked on many homes with Wright, including the David and Gladys Wright House in Phoenix and the Harold Price House in Paradise Valley. The influence of these historic homes can be seen in his sixth creation—and his fourth as an independent architect. Built along a well-defined geometric grid, the residence was completed in two phases, the first being a two-story plinth comprising the main living areas downstairs and the bedrooms upstairs, with an open-air balcony off the master suite. 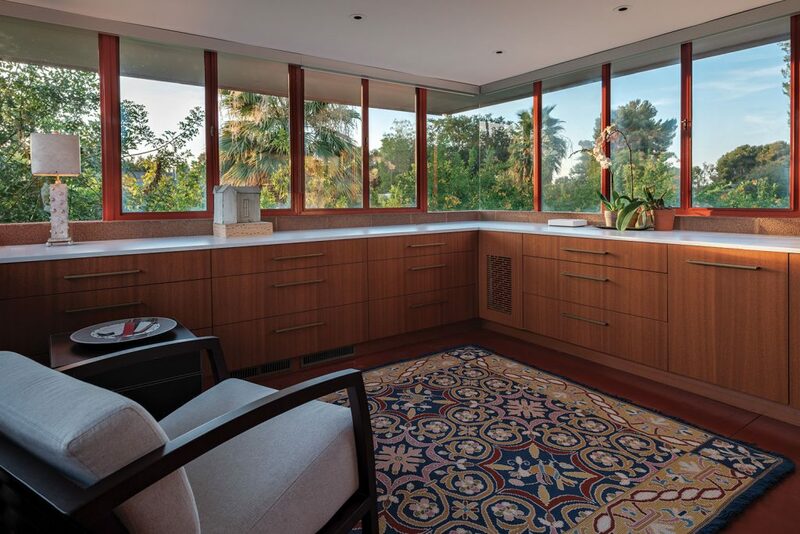 Later, Montooth added an expansive foyer with high ceilings and substantial clerestory windows, expanded the first floor to include a large dining area and increase the kitchen, and enclosed the upstairs patio. The architect maintained a cohesive look between old and new. In the now-open great room, what were once exterior columns with built-in light fixtures have become dramatic characteristics of the space. An understated motif featuring offset blocks and acrylic bulb covers is used both inside and out. The original front door was moved to the entrance of the foyer where it continues to greet guests today. 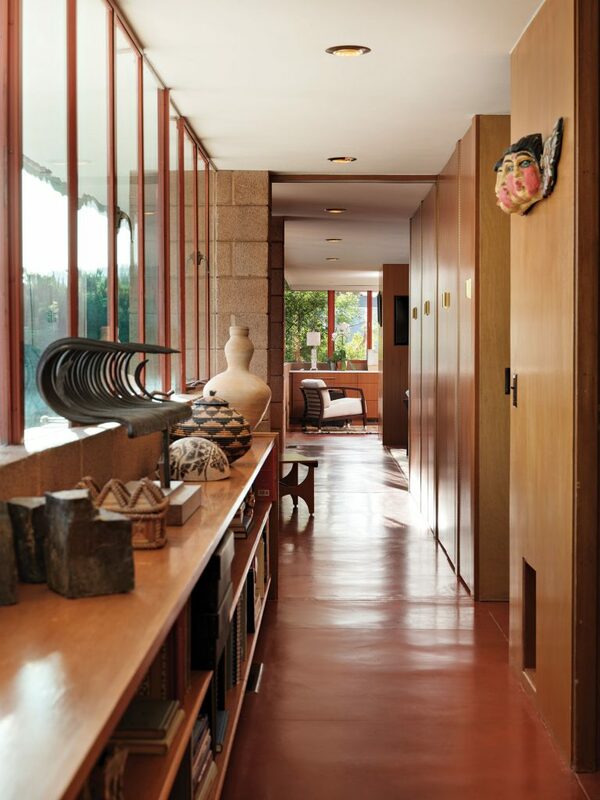 Scored red concrete floors run throughout most of the house. 1. Montooth later added a large foyer. The pass-through is where the original front door once hung. A painting by Rob Browning is displayed above a chair that belonged to the husband’s grandparents. 2. “This is such a grand space. It creates a mood of what to expect when you first walk inside,” the wife says of the foyer, which was added later by Montooth. Deviating from classic Wright design, which usually features tight, low entrances, this expansive room showcases a high ceiling and large clerestory windows. The front door is original to the house; it was relocated during Montooth’s renovation. 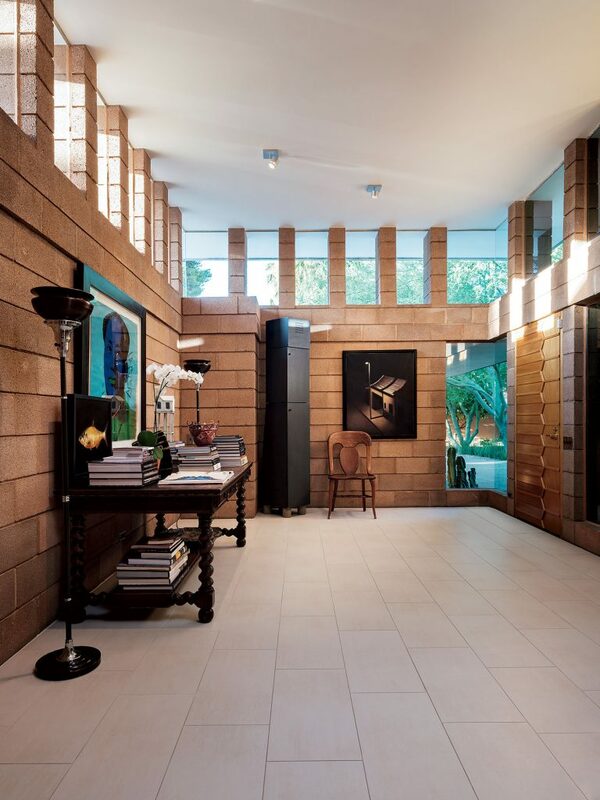 On the far wall is a painting the homeowners purchased in Spain by Gonzalo Sicre. The library table, chair and floor lamps are family pieces. 3. Large windows and French doors let copious natural light into the dining room. The homeowners brought the table from a previous residence. “We were able to extend it fully here. I love that it fits,” says the wife. “We like to just sit at it and have coffee, do puzzles and read.” The tea set was designed by Eva Zeisel. 4. 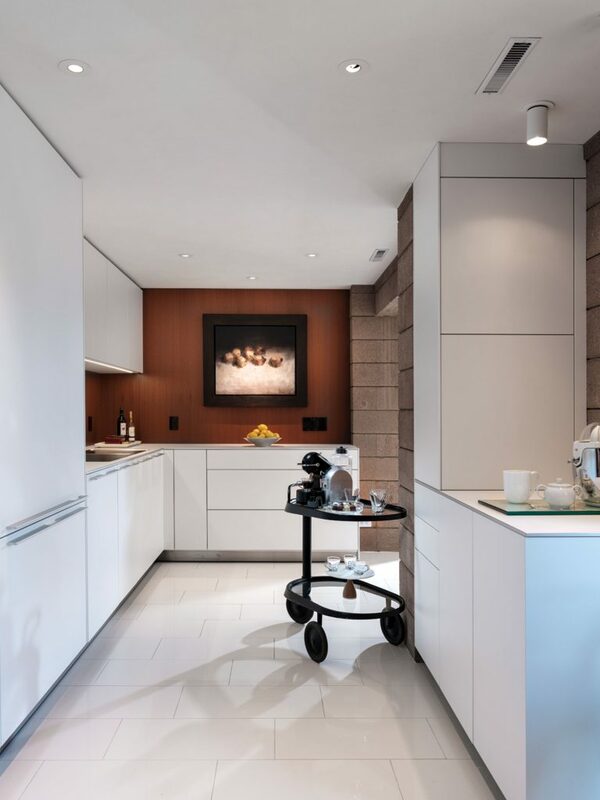 “We wanted to make a conscious differentation between the architecture and the new cabinetry,” says kitchen designer Robert Moric. “The bones might be old, but the attitude is young.” The painting is by Miguel Macaya. “The Warner Residence represents so many of Wright’s principles around great design and creating the organic connection between inside and out so one naturally grows into the other,” Graff notes. 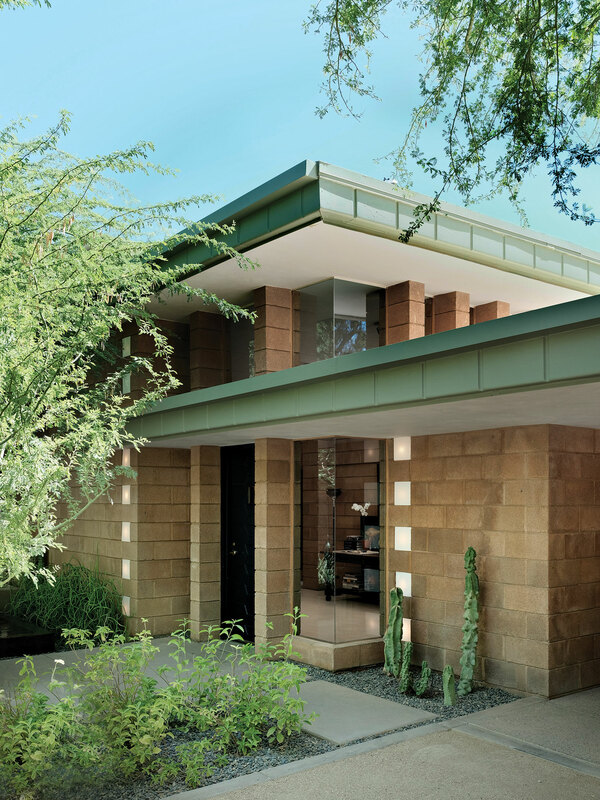 “It has that sense of place and site specificity.” Situated on a one-acre citrus grove, the once-rural abode is now nestled snuggly in the epicenter of Central Phoenix. Just a few months after Montooth passed away, the house went on the market—only the second time since it was built—and a couple looking to relocate to the Valley from New Orleans was immediately enchanted by its one-of-a-kind features. For the husband, who works in construction management, the dwelling’s noteworthy provenance was a bonus. 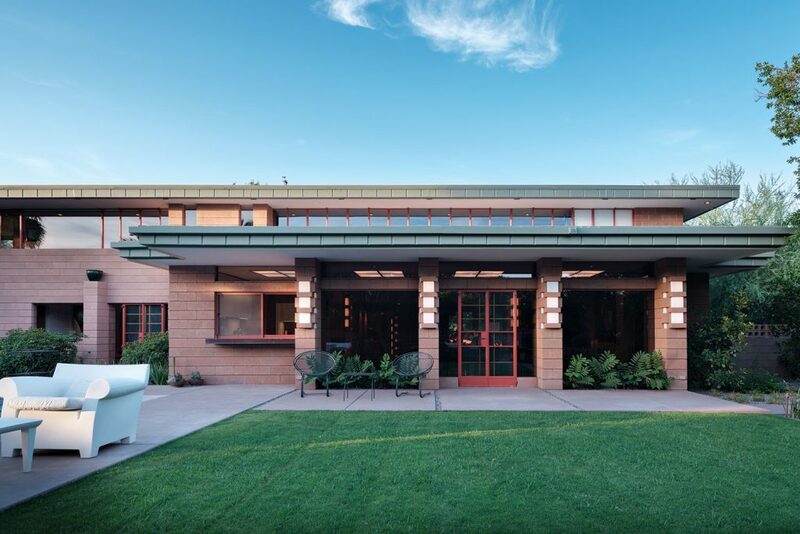 “Frank Lloyd Wright is one of the iconic American architects, and we all studied his work in school,” he says. 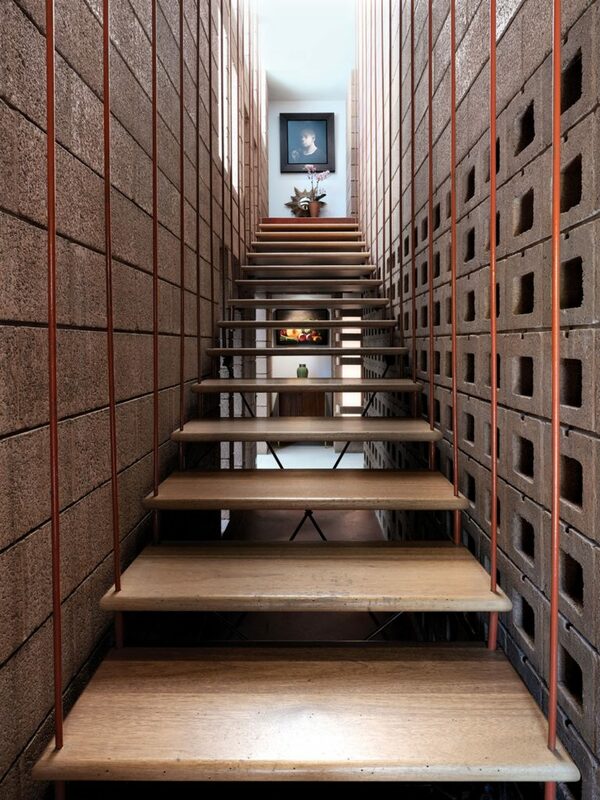 “To be in a house that was designed by one of his associates is pretty exciting. Besides the additions, little has changed to the interiors over the years. In the living room, the existing built-in seating area with shelving still provides a cozy spot in the winter to curl up next to the fireplace with a good book. The new owners updated the cushions with a two-tone blue color scheme. A pair of footstools designed by Montooth are original to the home. 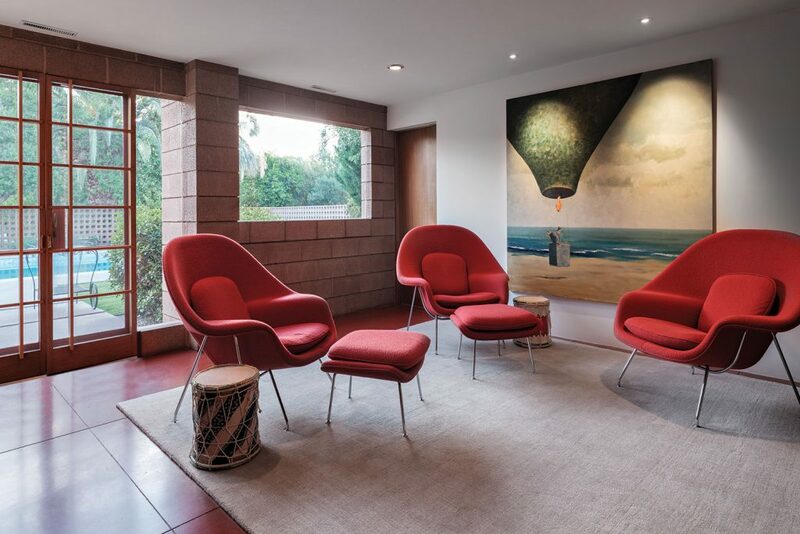 In the den, a grouping of crimson Saarinen Womb chairs adds a pop of vibrant color to the otherwise neutral decor. 1. Landscape architect Christine Ten Eyck added a burbling fountain near the front entrance that is visible from the living room. “Water is soothing and psychologically cooling for desert dwellers,” she says. The oak chair, which the homeowners purchased while living in Spain, is a replica of a piece Antoni Gaudí designed for Casa Botlló in Barcelona. The aluminum orb is a mock-up for one of the husband’s past design projects. 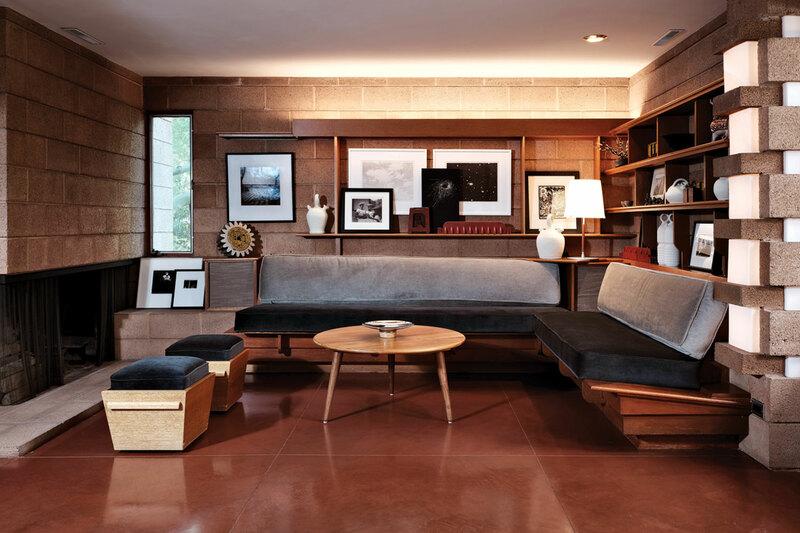 On the coffee table are a ceramic sculpture by Mary Fisher and a foundry mold, which the homeowners collect. 2. 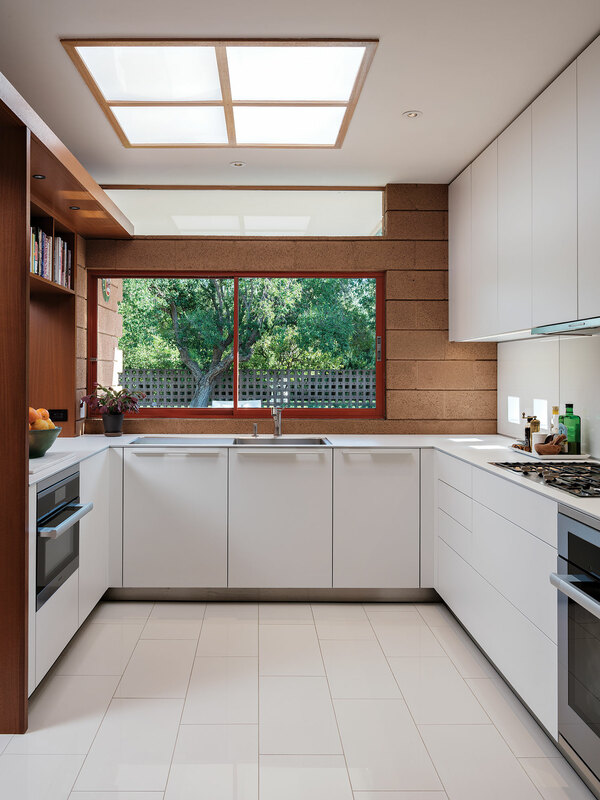 The homeowners replaced the dated kitchen with a bright white contemporary version. Upper cabinets to the left of the window were swapped for shorter shelves, allowing for better views to the dining room. The sleek laminate countertops are only 0.375-inches thick. 3. A long hallway connects the guest bedrooms with the master and sitting room, seen in the background. Original single-pane windows look out to the backyard and orchard beyond. “We like to open the windows and let the breezes come in,” says the wife. Built-in shelving displays art and books the couple has collected during their travels. 4. The home’s most striking feature is the suspended staircase, which is located just to the right of the original front door. The deep wood treads with a shallow rise are supported by steel cables. 5. Ten Eyck created the front landscaping for the home’s second owners. At the time, the yard was covered in asphalt. One distinctive attribute that didn’t change—and which remains the home’s most striking element—is the floating staircase suspended by red steel cables that serves as a centerpiece connecting the main living area with three bedrooms upstairs. Large windows on both floors overlook the backyard and a flourishing citrus orchard. While the city grew up around the house, its oversized lot and mature plantings offer privacy and lend a sense of isolation. 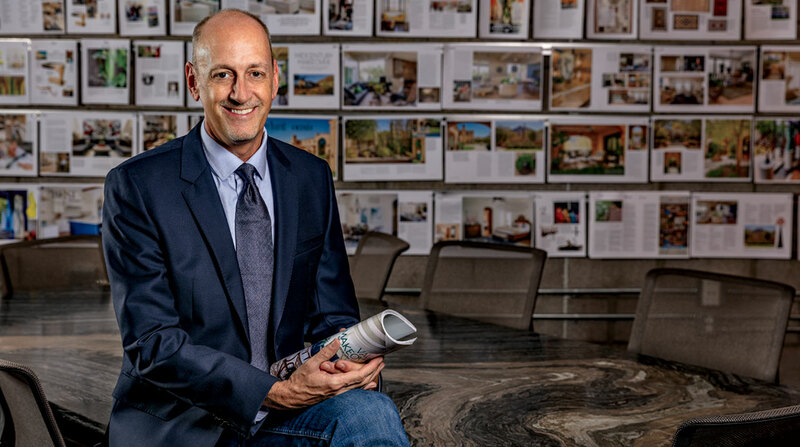 A wall of windows with large glass French doors on the back of the dining room expansion leads to the backyard and pool that, while newly renovated, reflects Montooth’s vision. On the main floor, rooms flow seamlessly from one to another—and to the exterior—thanks to an open floor plan. Light-colored furnishings and rugs offset the red concrete floors, block walls and wood accents. 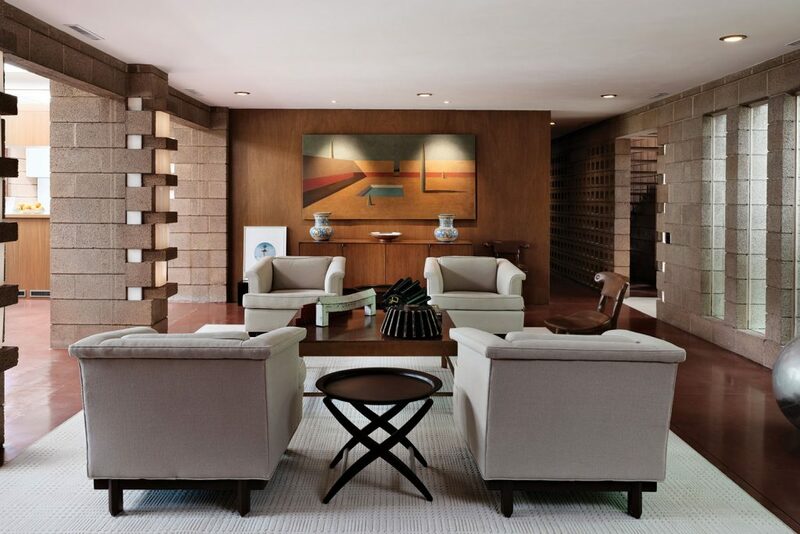 The cream-colored chair in the foreground is an original Frank Lloyd Wright- designed piece that belonged to the husband’s parents. The homeowners had the additional three replicas made for a matching quartet. To complete the backyard, a diving board was added to the pool. “Even if no one uses it, it’s such an iconic piece and a nod to the original design,” Briggs notes. The front yard needed only minor refreshing. Agaves that had completed their life cycle were replaced, candellia were replanted, and underperforming deer grass was swapped out for more aromatic jasmine, a favorite of the wife. 1. 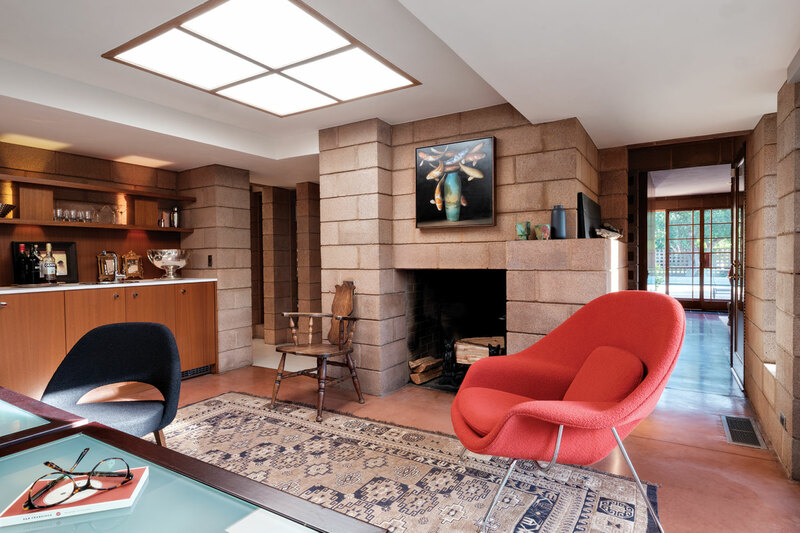 Just as Wright frequently did, Montooth included built-in furnishings in his design. The homeowners reupholstered the cushions in a simple two-tone blue palette. “The seating had a zebra-stripe pattern,” says the wife. “I felt that they needed to be very tailored and quiet to emphasize the horizontal nature of the setting.” The rolling stools are original. The table is a Hans Wegner design. 2. “In a house that has such a strong presence and character, you don’t want to over-ornament,” says the wife. The painting is by Catalan artist Ramon Enrich. 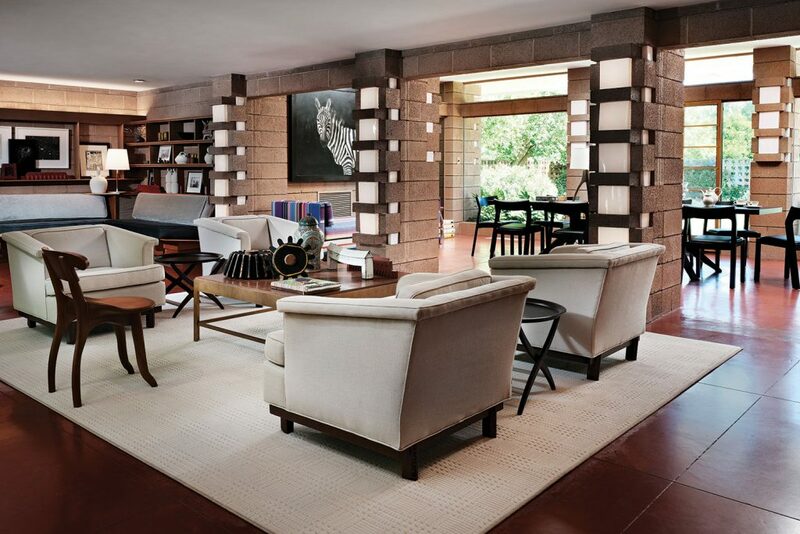 A pair of Spanish Talavera vases rest on a vintage credenza by Florence Knoll. 3. 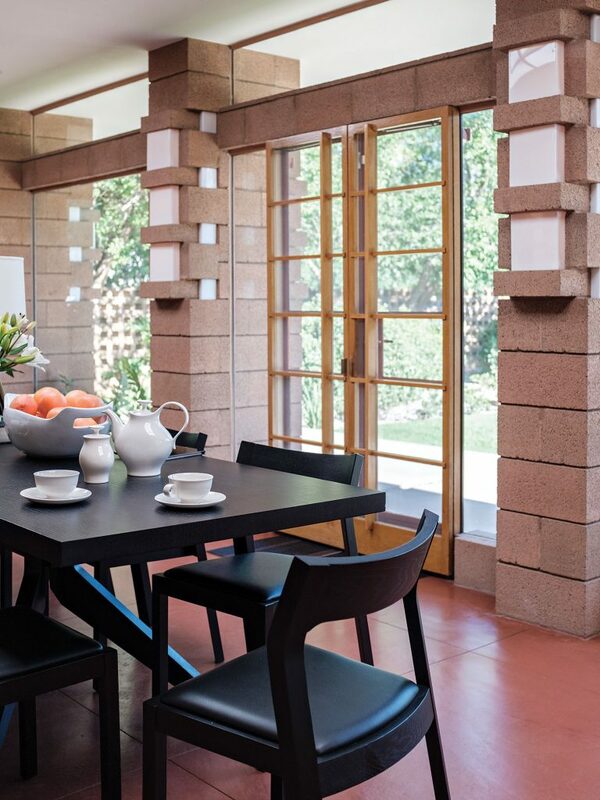 Montooth designed the dining room addition to appear as though it was part of the original build, incorporating the integrated lighting columns and red concrete flooring seen throughout the home. 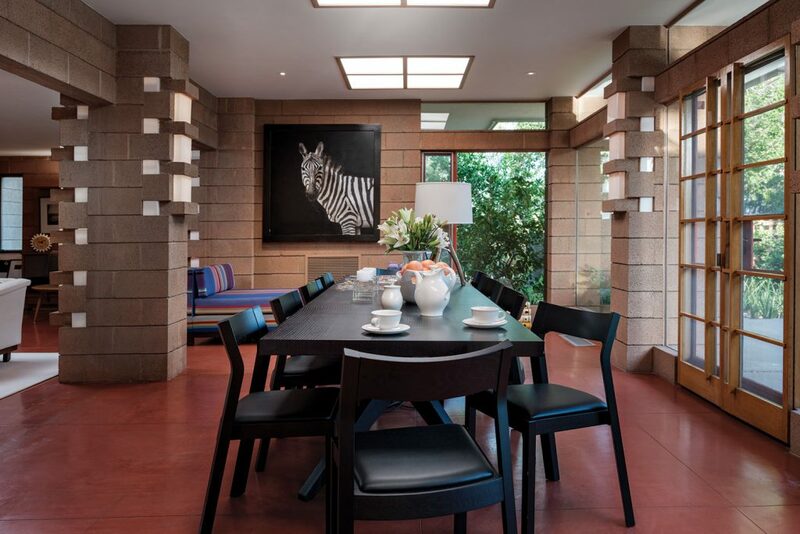 The zebra painting, purchased in Spain, is by Miguel Macaya. 4. In the den, a trio of Womb chairs offers comfortable seating without overwhelming the room. A painting by Nuria Armengol is a focal point. 5. The home office remained largely untouched; the owners replaced a brown countertop on the built-in cabinetry with white laminate. An oil painting by David Kroll hangs above the fireplace. The current residents agree. They consider themselves less as owners and more as stewards, fully appreciating the property’s heritage and its local significance. “We would never do anything to destroy any of the aspects of the house that were here,” says the wife.